A scarce 19th century map od Denmark. Das Konigreich Daenemark nebst seinen Nebenlaendern in Europa. 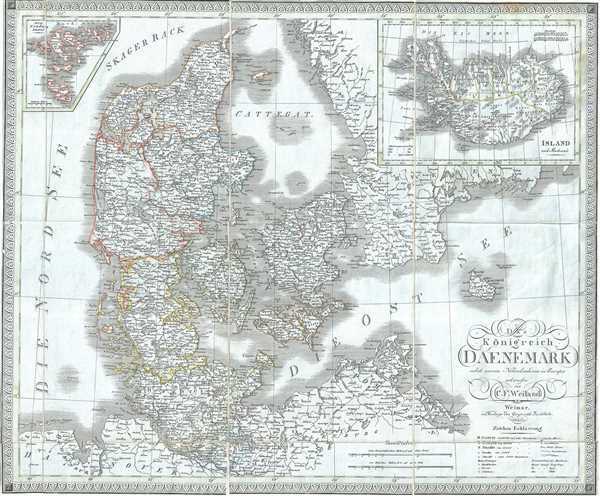 This is a scarce separate-issue example of the 1825 C. F. Weiland map of Denmark. The map covers all of Denmark inclusive of the Duchy of Holstein. An inset in the top right quadrant features a map of Iceland, which has been fairly well mapped since the late 16th century. Another inset in the top left quadrant depicts the Faroe Islands. Today these stunning green islands are considered one of the most beautiful and unspoiled places on Earth. The Kattegat (Cattegat) is also identified. Various, important rivers, islands, cities and other topographical details are noted. At this time in history, Scandinavia was in the midst of a prolonged period of peace and prosperity that led to a cultural and population boom. This map was created by C. F. Weiland and published by the Weimar Geographical Institute. Carl Ferdinand Weiland (1782 - 1847) was a German cartographer active with the Weimar Geographisches Institut, where he headed up map and globe production, in early and middle part of the 19th century. Weiland was a trained as a military cartographer who, with his career at the Geographisches Institut, move into the private market. Among his other work, Weiland issued a German edition of Carey and Lea's American Atlas. Their edition, which was fully re-engraved in Germany, is of superior workmanship and stands out as some of the finest 19th century maps of individual U.S. states printed outside of America.Carl Ferdinand Weiland (1782 - 1847) was a German cartographer active with the Weimar Geographisches Institut, where he headed up map and globe production, in early and middle part of the 19th century. Weiland was a trained as a military cartographer who, with his career at the Geographisches Institut, move into the private market. Among his other work, Weiland issued a German edition of Carey and Lea's American Atlas. Their edition, which was fully re-engraved in Germany, is of superior workmanship and stands out as some of the finest 19th century maps of individual U.S. states printed outside of America. The Geographischen Isntitutes Weimar (fl. 1804 - c. 1903) was a German map and globe publishing house and geographical research institute based in Weimar. The organization primarily focused on republishing and improving upon the works of earlier cartographers, including Kitchin, Jefferys, Carey, and others. In general, its publications are known for their fine engraving, attention to detail, historical accuracy, and overall high quality. The firm was founded in 1804 by Friedrich Justin Bertuch (???? - c. 1845) and, on his death, passed to his son Robert Froreip (???? - 1855), then to Louis Denicks of Luneberg, then in 1859 to Voigt & Günther, in 1883 to F. Arnd, from 1890 - 1893 to Julius Kettler, and in 1903 to Max Wedekind. During the institute's height in the early 19th century, most of its cartographic publication was overseen by Carl Ferdinand Weiland (1782 - 1847). The firm also employed the cartographers Franz Xaver von Zach, Adam Christian Gaspari, Heinrich Kiepert, Karl and Adolf Graef, Julius Kettler, Carl Riemer and Karl Christian Bruhns. Very good. Dissected and backed on linen. Minor spotting. Minor wear along fold lines.